Picking up with more viewers than it left off with last spring, Wednesday’s one-hour Season 4 premiere of A&E’s Duck Dynasty should end up with top bill-ing when all of this week’s prime-time ratings results are in. DD drew 11.8 million viewers nationally with 6.3 million of them advertiser-prized 18-to-49-year-olds. That exceeded the show’s previous record of 9.9 million viewers and 5.5 million 18-to-49-year-olds for its April 24th Season 3 finale. A&E brags that Wednesday’s re-launch “became the number one non-fiction series telecast in cable history.” But that’s only if one doesn’t consider ESPN’s Monday Night Football to be a weekly series. Whatever the case, it’s still an impressive feat for a bunch of scraggly bearded guys from Monroe, Louisiana. 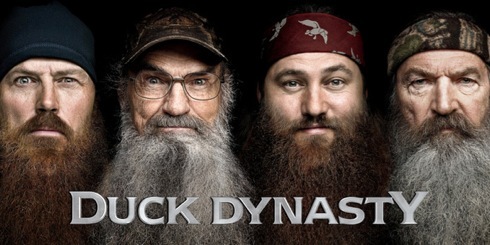 “Thanks to its authentic and engaging characters, Duck Dynasty has become more than a reality show. It is a cultural phenomenon,” A&E GM and executive VP David McKillop gushed in a publicity release. DD surpassed the 10.4 million viewers for Monday’s latest episode of CBS’ Under the Dome, whose numbers likely are suppressed somewhat by an ongoing Time Warner blackout of CBS in roughly 3 million subscriber homes nationally. It’s highly unlikely that any other broadcast or cable program airing through Sunday night will approach the viewer totals for either DD or UTD. AMC continues to bask in Sunday night’s personal best ratings for the return of Breaking Bad, which had 5.9 million viewers nationally and 3.6 million within the 18-to-49 motherlode. That made BB the No. 1 cable program for the week of Aug. 5-11, edging TNT’s Rizzoli & Isles (5.5 million viewers). The audience for the first hour of BB’s eight-episode final season was slightly more than double that for last summer’s July 15th start of the series’ two-part, 16-episode swan song. Lifetime has ordered a Season 2 of its Devious Maids series. Airing on Sunday nights, it’s “the network’s fastest-growing drama ever,” Lifetime says in a publicity release. Also on the cable series renewal front, TNT has ordered a fifth season of Rizzoli & Isles and a third for Major Crimes, its spinoff of The Closer. Another TNT drama, Perception, likewise has been re-upped for a Season 3. President Obama’s Aug. 6th appearance with Jay Leno drew the Tonight Show’s biggest audience since July 27, 2012, when it followed the opening ceremonies of the London Olympics. NBC says the Obama sit-down lured 4.947 million total viewers opposite CBS’ repeat of Late Show with David Letterman and ABC’s new hour of Jimmy Kimmel Live. For the week of Aug. 5-9, Tonight averaged 3.8 million viewers while both the Letterman and Kimmel shows drew 2.2 million viewers. Nonetheless, Leno is still being evicted, with NBC recently announcing that his last Tonight Show will be on Feb. 6th of next year. Jimmy Fallon will then take over the show on Feb. 24th, the night after the closing ceremonies of the Winter Olympics. During an interview session with television critics at this summer’s network TV “press tour,” NBC entertainment chairman Bob Greenblatt said there are no second thoughts this time about removing the No. 1-rated Leno. That seems doubtful, given Leno’s workaholic regimen and the likelihood of other late night suitors. It also seems 100 percent certain that NBC will not revisit its move to give Leno the Monday through Friday 9 p.m. (central) slot after Conan O’Brien inherited The Tonight Show. It ended up being one of the most disastrous programming stratagems in TV history.